On October 3rd, Hertless Brothers joined the team with Gilbane Construction and Urban Grid Solar to begin installation of the largest Solar Panel Project in the Commonwealth. The panels will be installed on the Virginia Distribution Center in Sandston, VA. Funding for the project is from a Public-Private venture between Trane and the Commonwealth of Virginia made possible under the PPEA Act. It seems so simple – pick a color and have your metal roof installed. Well – it almost is. The most important part of choosing a metal roof is the Seam. Metal roofs can be installed on almost any slope or any roof. The trick is selecting the right panel seam for your project. On low slope applications, it is critical to have a seam that is water tight. Choosing a flat lock and soldered seam or a double locked vertical seam ensures that water will not back-up into your roof. 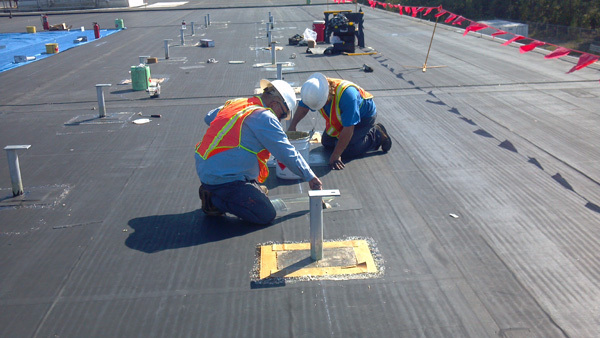 On steep slope applications, seam choice also determines the aesthetic and performance characteristics of your roof. When choosing your metal roof, make it simple, choose the right seam. Virginia is known for some of the best slate in the world! That slate comes from just down the road in Buckingham County. When considering slate for your roof, remember to account for these few things. Slate is extremely heavy compared to asphalt shingles or metal roofing. Make sure your structure can support the weight. Slate comes in a variety of sizes. The size you select influences the installed cost. Larger slates are much more expensive to purchase but more efficient (lower labor cost) to install. Smaller slates are less expensive to purchase; however but have a much higher installed labor cost. Slate takes time. Your slate is hand quarried, so it takes time to be made and be shipped to your project site. Slate also takes longer to install than other roof materials such as asphalt shingles or metal. Slate, once installed can last a hundred (100) years or more. How great is Slate!